Finally, there's a decent bagel spot in the city and I couldn't be more thrilled. 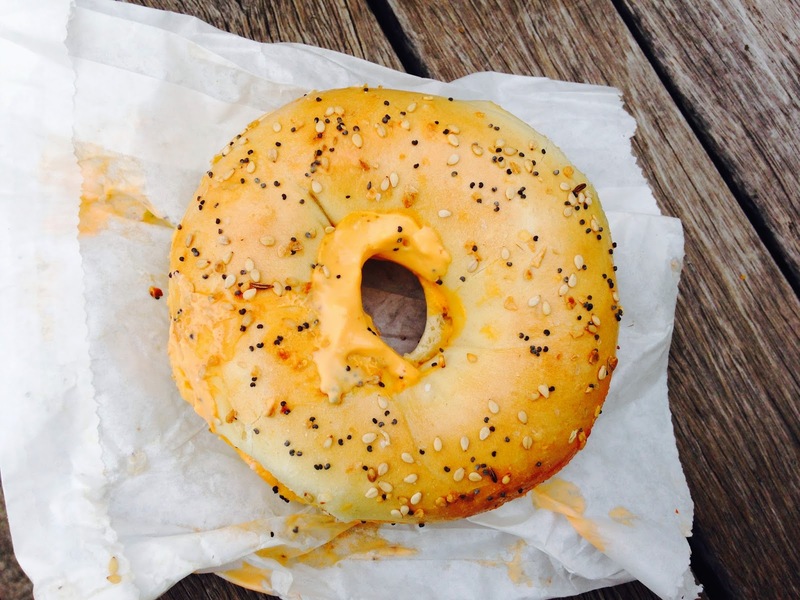 Brobagel, the new bagel shop from Piece Pizza owner Billy Jacobs is now open in Wicker Park. The to-go shop is in the former Salon Blue space adjacent to Piece Pizza. Billy Jacobs is one half of the famed Jacobs Bros. Bagels empire that began in 1983, and was purchased by Big Apple Bagels' parent company in 1999. Billy has brought back the bagels and I can personally vouch for their awesomeness. I stopped by on a Saturday morning with the BF and we tried some bagels with cream cheese, as well as bagel sandwiches. The bagels are New York style, boiled, then baked, resulting in a crispy outside and chewy middle (the way bagels should be, in my opinion!). Bagel options include the usual suspects like, sesame, onion, garlic, everything, pumpernickel, and not-so-usual-suspects like walnut raisin bran, and even a beer bagel. Spread options also balance the familiar and unfamiliar including scallion, veggie, sriracha, garlic confit, and whipped tofu. 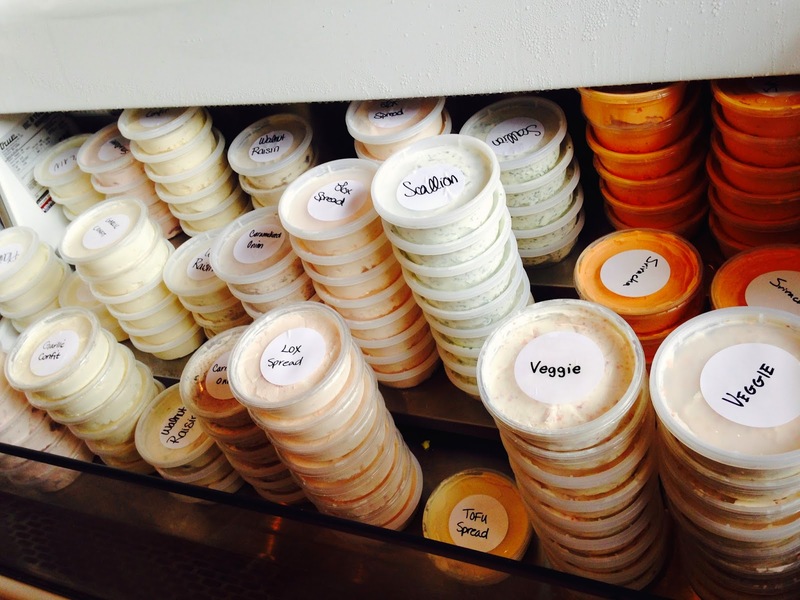 So many cream cheese options! We both chose an everything bagel with sriracha cream cheese. Lucky for us, the bagels came right out of the oven so they didn't even need to be toasted. They were like a typical NY style bagel, though slightly smaller than you'd find in the big apple. The cream cheese tasted, and looked like spicy nacho cheese. It was pretty fantastic and unique. 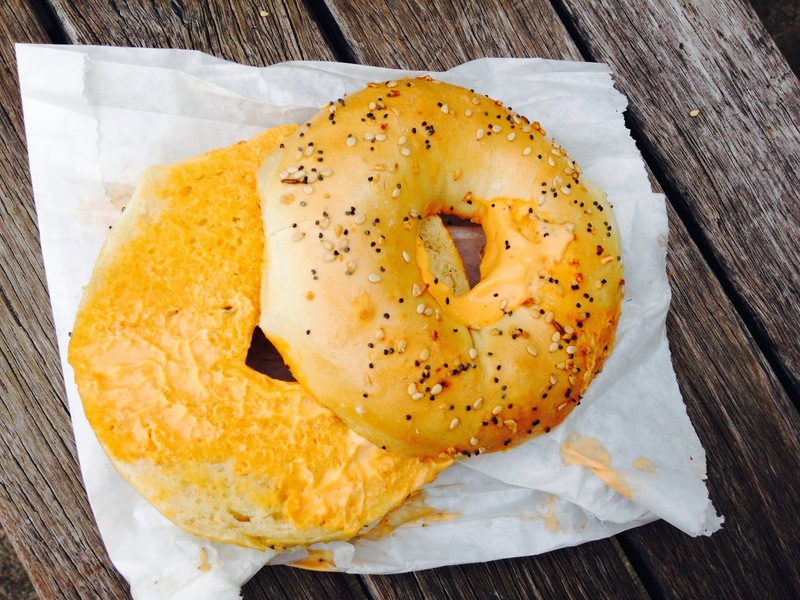 Brobagel also offers a menu of bagel sandwiches which feature spreads, premium meats and cheeses, and veggies. The BF and I tried the Turkey Special with sliced turkey, bacon, Manchego, fennel, tomato, and caramelized onion spread. Unfortunately, I forgot to snap a photo before we ate our sandwiches but they were ginormous. They almost looked like two bagel sandwiches in one...they're that tall. I wasn't a fan of the massive globs of caramelized onion spread so I'll definitely ask them to go easy on it next time. You can also build your own, or order a selection of salads or soups. Brobagel is my new fave bagel in the city. I appreciate the unique variety of spreads and bagels and they also serve up some great Metropolis Coffee. The bagels and sandwiches are on the pricey side, but I guess you get what you pay for! I'm giving Brobagel 4 ghosts for their delicious bagels, and that hot sriracha spread! I'm not a fan of Chicago Bagel Authority because they steam their bagels and I prefer a crispy crust! I used to eat Big Apple Bagel almost every day for lunch in high school! So excited to try this place! Thanks for your review! I loved Big Apple Bagels!